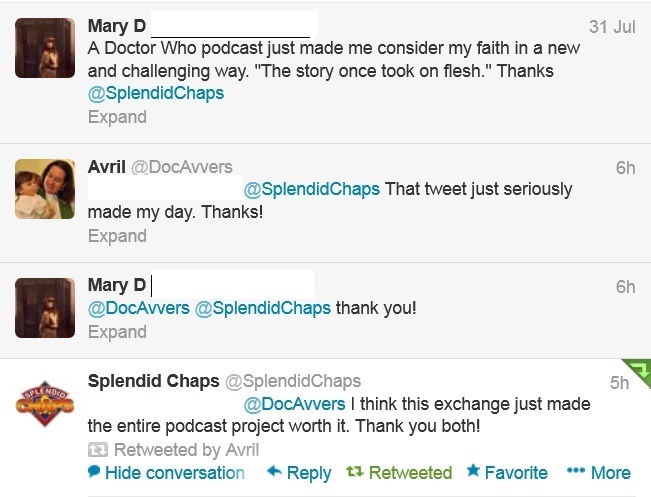 A few weeks ago I was one of the guests on the fabulous Doctor Who-based podcast Splendid Chaps. If you’re a fan of the Doctor and you haven’t found this podcast, go check it out NOW. It’s a wonderful fiftieth-anniversary celebration of Doctor Who, with podcasts on each of the eleven Doctors and on various themes: Family; Fear; Clothes. Continuing to milk that appearance on AHIGST from so many years’ ago (well, two), I was invited to be a ‘Splendid Chap’ (awesome!) and talk about religion. I participated in (Part Two) of Seven/Religion. It was so much fun! I get a wee bit nervous when I suspect I’ve been invited somewhere as a ‘token believer’, but the other Splendid Chaps didn’t look at me as though I was crazy for believing, and I got to talk about faith and the Doctor, a topic about which I can happily blether for hours. As, in this case, I did. I really need to thank Adam Hills for making fun of me. It’s opened so many doors; I’ve had a great time; and in a weird way I think I’m doing better ministry than I ever did before. I’m a very lucky fangrrl. This entry was posted in Church of Latter-Day Geeks and tagged Church of Latter-Day Geeks, Doctor Who, ministry, Public Ministry, Splendid Chaps. Bookmark the permalink.